the past. who doesn't have skeletons or ghosts of the past whose ugly heads show up from time to time? one moment you're happy and content, moving forward, the next, you're knowingly or unknowingly looking back at the past. the what-if's, shoulda-couldas, the path not taken - regrets. moments that did not happen, and you can't just take off your mind on wishing that it could have. there's a tiny voice deep within you asking what could have happened if you chose, pursued, decided, or chased the other path. the painful, traumatic experiences. moments you wish didn't happen, but they did. hurtful experiences that tore you apart and changed you. a tiny voice may taunt you, show you bits and reminders of what it was, bringing forth the feeling of pain and trauma that came with it. all of these things, part of the past. and yet, we hold on to them still. they impact our daily dealings with other people. they put hindrances and rocks (no i take it back - not rocks but boulders) in the middle of our relationships. they stop us from growing and enjoying the present. we are not truly happy, something's holding and keeping us back. we cannot give ourselves fully and completely - because we are still living in and haunted by the ghosts of the past. it's not really good to harbor feelings and carry on burdens of the past. but hey, easier said than done, right? we needn't forget the past completely. everything happened for a reason. the decisions and experiences that we went through taught us to be better and stronger. we are molded into better persons of character with these experiences. 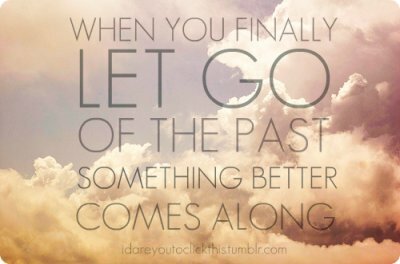 there isn't an easy formula to let go of the past, it doesn't take just a snap of the fingers. it will take effort on your part to do so. acceptance of what has been is a step. forgiveness also will go a long, long way. if you have wronged someone, make amends. if someone wronged you and they are truly trite, learn to move on from there and forgive. with God's grace and guidance, it'll all happen. trust that everything else will fall into place.